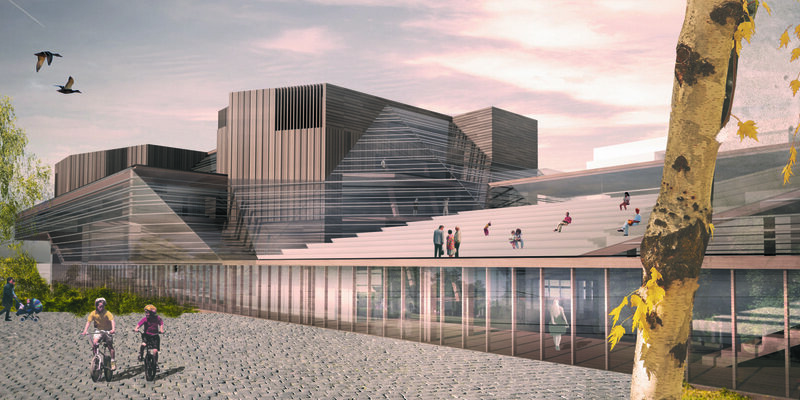 Our proposal for the Helsinki Central Library Architectural competition explores the combined potential for the most energy efficient building technologies and behavioural change to drive a thriving, sustainable society. These principles are founded on an architecture of transferability, transparency and inventiveness. 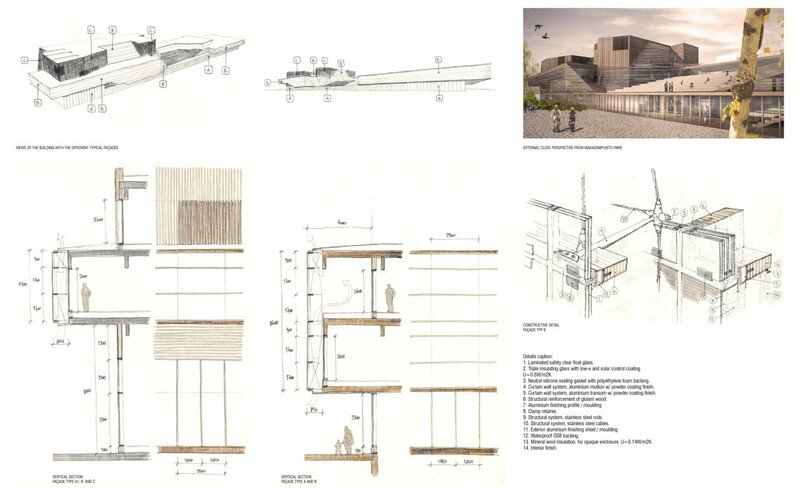 The architectural concept was developed from our office in Barcelona , working from the very beginning with a multidisciplinary team that has made this project one of the most spectacular designs we have produced at the office, both in terms of design and sustainability issues. 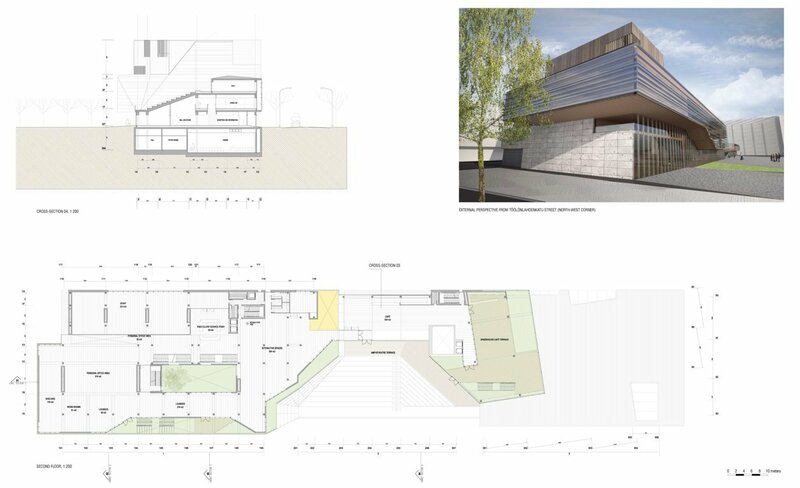 Not only was the result very satisfactory, but the process of design itself proved to be very exciting, with all parts of the team brainstorming to help create an architecture that provides a vibrant, diverse mix of uses that consolidate a shared identity . 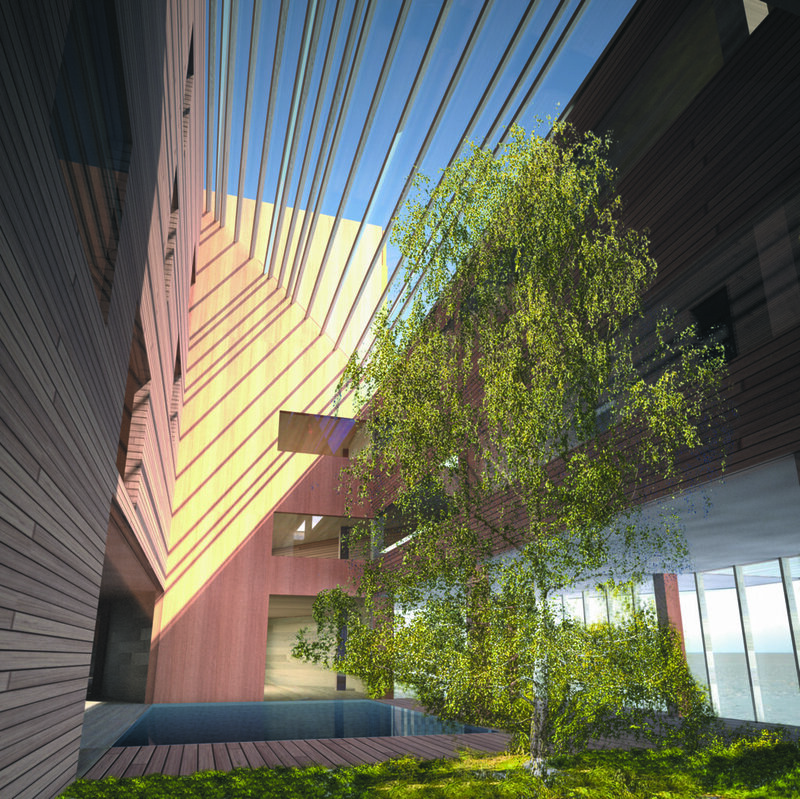 A building linked to sustainable living,with an increased sense of ownership and attachment for the user. This personal investment in turn fosters a self-sustaining community. The Helsinki Central Library is located in the very centre of Helsinki, the Töölönlahti area. The building searches both a maximization of the south and west facades (in order to boost solar gains) and the views towards Makasiini park, immediately west . The building volume is concentrated in the northern wing of the site, free from the long-streching shadows of the buildings located immediately south. In the southern part of the building, where the sun scarcely arrives, a two-storey volume is articulated around inner patios. The classical perimeter block eastbound reinforces the existing street pattern and serves to protect the clearly oriented westbound programme from the noise of the surrounding streets. The building is conceived almost as a town, with many diverse spaces, uses and proposals, comfort conditions, occupancy and loads. All of them together under a common atmosphere of wood and glass. The central element and heart of the design is the generous greenhouse spaces, flooded by daylight, that give passers-by the opportunity to get to know the activities displayed inside while browsing in the shop stocked with the latest cultural products, sitting in the cafe or relaxing in the underground sauna. A space that allows for use in intermediate seasons and improves the global energy performance of the library. The publicly accessible greenhouse is occupied by a large expanse of water in the central courtyard and a tree plantation, as well as a sloping glass roof which encloses the main entrance hall. The hall extends visually over 4 floors and it locates exhibitions, concerts and large-scale meetings. The greenhouse features penetrates into the hall – blurring the boundary between interior and exterior spaces and introducing reflected sunlight into the most unexpected areas of the building. The result is a play of light, colour and water which creates a new and uniquely animated room in the city. The design allows to take the maximum solar radiation during periods of energy demand for heating and avoid it during periods without energy demand for heating. At the same time, it allows for a permanent glare control in the reading areas. In consequence the building to minimizes the heating energy demand, avoids the cooling energy demand and maximizes the natural lighting and visual comfort. The new, low-energy library building provides for a rich variety of working methods with individual, group and open-plan offices, as well as numerous multi-purpose zones. All workspaces are directly at the facades affording optimum use of natural light and providing users with beautiful views of the surrounding greenhouse and the Makasiini park beyond. Directly related to the greenhouse entrances, the atrium is the central location for people to meet and communicate. As in a city, bridges, ramps and steps connect central spaces with each other. Here people can meet, talk and enjoy the inspiring ambiance. 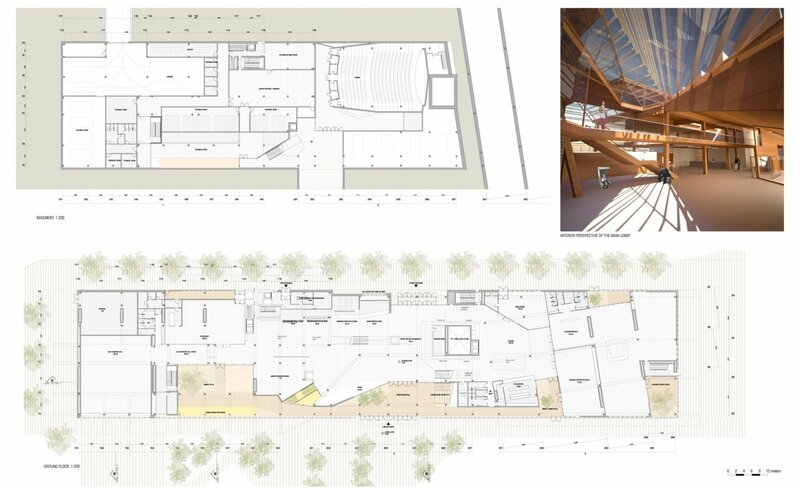 The underground facilities (cinema, sauna) and ground floor spaces (children’s world, restaurant, multipurpose space), as well as the two wings of the Library and mediatheque are interconnected across the hall. From the hall the view of the greenhouse full height can be perceives ad going up to the upper levels of the library, creating a sense of orientation and visual unity. The library is a user-friendly research facility, working in harmony with nature; versatile and ecologically sound. The building is designed not to dominate its urban setting, but to embrace the landscape, with all workplaces in direct contact with indoor and outdoor gardens. The indoor gardens (greenhouse) provide the focus for daily activities and function as informal meeting areas. 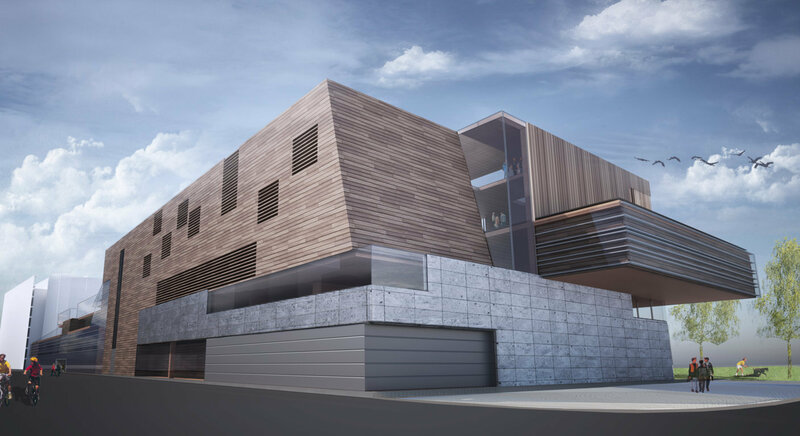 Beyond this, they are an integral component of the building’s energy concept, improving the performance of the external envelope. The library has been technically designed to be extremely flexible. A Technical floor in all the libray spaces allow to reach easily any location with telecomunications and electric wiring. This means that any technical device can be plugged anywhere as a medium for digital information, in any format (text, image, video, sound…) : personal computers, laptops, screens, interactive surfaces, special lighting, music, projections… Climate system has ben designed (radiating walls and air cooling/warming) in a way that allows technical floOr to be extended all over the spaces of the library (avoiding radiation floor). The entire library is furnished with moveable furniture to allow easy distribution changes. The services provided by the library demand flexibility. The project has open spaces, consciously designed as an open landscape where furniture, technical devices , and even some collective spaces can change location easily. Shelving, computer tables, individual laptop informal seating, moveable client information points, self-service lending machines and individual audiovisual capsules, for instance, can be placed anywhere. Some spaces are designed as moveable architectural elements, as moveable spaces: client service points (including workspace), workrooms for clients, interactive spaces, pop-up-info spots, some quiet areas, collective game capsules, collective audiovisual projection capsules and some meeting rooms can be placed anywhere on the accessible floor. Some of these moveable spaces are proposed to be in modular microarchitecture stands. This modular system allows to have spaces into spaces with varying dimensions and layout: from small workrooms for two clients to meeting rooms for 30 people. Inside these stands there are different conditions for sound and lighting, while there is the same atmosphere and climate control than in the open space. 2) Allow for the possibility of reciclying at the end of the building life-cycle, giving priority to the mechanical building joints, assuring the reversibility of the edification. In the use of a timber structure and wooden finishings, the library building promotes warmth and naturalness in all its spaces. The finishings are designed both to evoke and respond to the volatile, ever-chaniging northern light. Structurally the new building is entirely conceived in Finnish timber, one of the most sustainable methods available (in Finland particularly). Used up to now at small scale buildings, there is much to be gained from developing systems for larger structures. The intricacies of a large timber structure, particularly fireproofing, stability and vibration have been here resolved into replicable and versatile systems, with a union of advanced sustainability technologies and conscientious architecture to achieve the lowest environmental impact without compromising spatial quality and beauty. 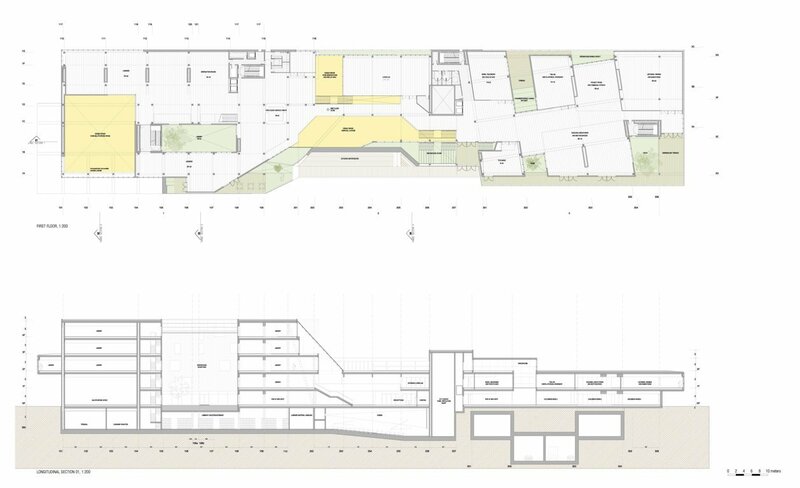 The plan is non-hierarchical and extroverted: a tightly integrated public programme allows open access throughout the building. 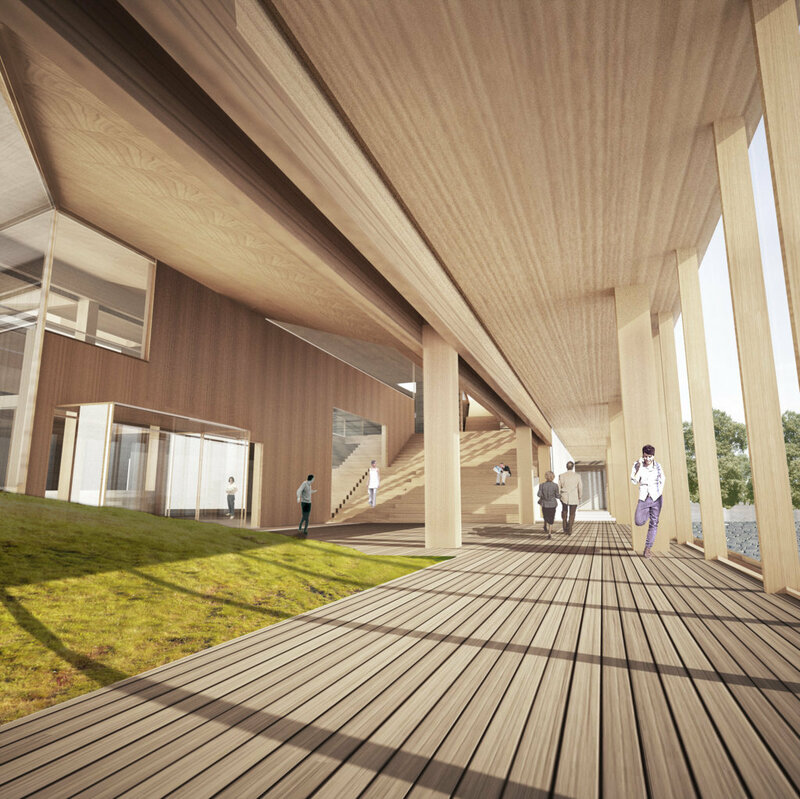 Finland’s advanced timber industry makes it a very equitable choice for larger projects. Local skills and sources render it among the safest, healthiest and most economical available. A terraced volumetry and greenhouse and a central atrium bring daylight and natural ventilation to each of the workplaces. Planting across all stepped levels associates the building with prominent green areas throughout Low2No and the large public park beyond. 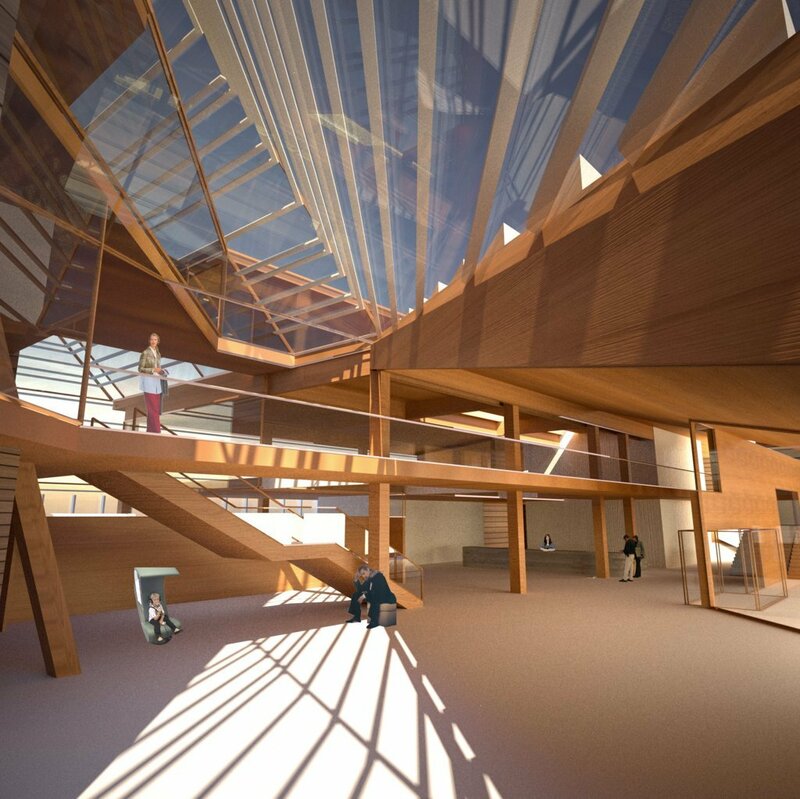 The timber structure is visible within the library spaces, contributing to the architectural and atmospheric quality. The structural system is a flexible set of laminated spruce wood,as well as the inner an outer ventilated spruce-plank facade. Window frames, accessories and supplementary structures are built in pine wood. Suspended ceilings where required are also made with pine wood, while doors are plated with birch. A.- Ground floor typical façade. Single skin glazed façade with a vertical appearance. Aluminium curtain wall system coupled to glulam wood structural profiles. Triple insulating glazing, with low-e and solar control coating, thermal insulation value 0.6W/m2K. Opaque enclosures with exterior and interior finishes made of powder coated aluminium sheet, mineral wool insulation with enough thickness to obtain 0.14 W/m2K. A’.- Ground floor typical façade / double height. Double skin glazed façade with a horizontal appearance. Laminated safety clear float glass exterior skin. Vertical trusses made of stainless steel cables and tie-rods. Aluminium curtain wall system coupled to glulam wood structural profiles. Automated top and bottom ventilation system for the greenhouse according to air conditioning concept. Interior skin formed with double-glazed type A and opaque type C systems. B’.- Double skin façade / inclined. Wood strip veneer, with a horizontal or vertical appearance according to design. Windows are with triple insulating glazing, with low-e coating, thermal insulation value 0.6W/m2K. Opaque walls with mineral wool insulation with enough thickness to obtain 0.14 W/m2K. How to catch the maximum amount of solar energy resource for thermal proposes on winter, when the sun may be almost everywhere? How to activate all facades? How to integrate tracking collectors? The building itself is the solar collector. A Greenhouse all around catches all solar radiation increasing temperature on this boundary space, and keeps building thermal radiation, otherwise lost. The Greenhouse is, in fact, a low temperature 3D solar collector, with almost the same radiation acceptance but a higher effective performance because the lower Temperature inside drives to lower thermal losses. Beyond the clear need of high insulation standards in order to reduce thermal losses, since those are proportional to temperature difference between inside and outside spaces, the Temperature increase in the Greenhouse, the boundary condition for building, directly reduces thermal losses, and through this, energy load and consumption. A main part of the Greenhouse concept is, not only energy efficiency, but the improvement of conditions in this boundary space, that may generate new ways of use, not in, not out, especially on spring an autumn. The thermal conditions in this space will depend not only on solar radiation, but on building conduction thermal loses and also on waste air coming from the ATUs that will be throw out in it. The conditions in Greenhouse will be automatically controlled to reach better global system energy performance, by the use of natural ventilation. These conditions include Temperature, but also Humidity and C02. Equilibrium with natural vegetation presence and water pulverization on summer will be part of control strategy. Building internal air conditioning will be solved differently for each use, due to their different requirements. Normal high occupancy spaces will be conditioned with conventional air systems. Double high spaces will be conditioned with low velocity air systems. And medium occupancy spaces, like reading rooms will be conditioned mixing radiant systems for sensible load and air systems for latent loads (humidity treatment) and peak loads. Due to this variability a central air conditioning system won’t exist, but a limited number of systems supplying one or more thermal zone. As main strategy for cooling, ATUs will work using external fresh air to replace internal air, not only for ventilation proposes, but for cooling. Although the ATUs will include cooling batteries to cool air streams, since natural ventilation will be main energy source, it’s expected to have a few consumption for cooling proposes. 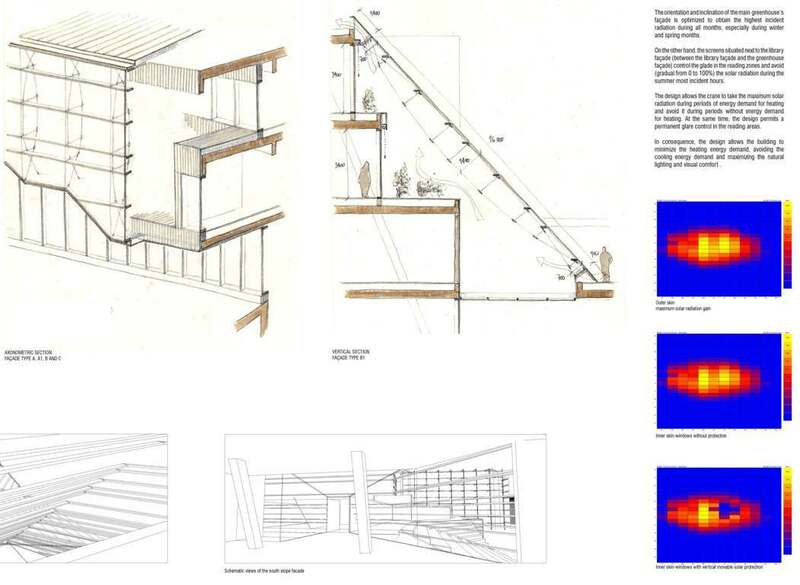 Nigh ventilation is also a strategy implemented on inertial parts of the building. Since different uses may reach to different loads, and those could instead be complementary, after a detailed analysis of loads, a water loop between some HVAC systems including Heap Pumps connection will be designed. This system integration strategy will allow to conditionate some spaces with heat or cool exhaust from others, reducing de global demand of building. Minimizing primary energy consumption. DHC connection. Due to the high efficiency of existing DHC net makes no sense to implement local heating and cooling production systems, but reducing as far as possible the loads and power required from the net. Last aspect to be optimized is the way of connecting the net. Since dehumidification systems are based on natural ventilation and cooling systems does not require low temperatures, one option to increase performance and reduce primary energy consumption is to connect to the cooling net on the return pipe, increasing centralized cooling system performance. The ventilation of each piece is ensured by a net of vertical ventilation ducts, controlled by adjustable thermostats. The mecanichal ventilation system is equipped with a air-to-air heat exchanger, which employs a counter-flow heat exchanger (countercurrent heat exchange) between the inbound and outbound air flow. This system takes advantage of up to 80% of the generated heat for ventilation purposes, and it is used to air-condition each piece. These ducts form part of the architecture, in the form of well dispsoed concrete walls, with a thermically activated surface that produce a radiant facing in each activity space, giving the inertia and comfort that the library needs for its 24-hour use. The building layout assures natural illumination and provides contact with the outside, in a climate where daylight is precious. The creation of the greenhouse enclosure generates spaces in which the visitor hardly notices the change from interior room to open spaces, as well as producing a metaphorical recreation of the finnish natural world. It sets the user in a constant dialog, from nature to architecture, and from architecture to nature. The double façade of the greenhouse lets in first instance all the light in the building, while the inner facades have different treatments, according to the activity developed in its interior. While the public spaces enjoy the full views of the outdoor space and the greenhouse buffer, reading areas are equipped with adjustable motorized exterior screens, that allow for the control of glaring and luminosity. Digital and viewing rooms have selected openings to the greenhouse spaces and courtyards. This entry was posted in Public Buildings. Bookmark the permalink.